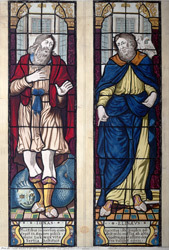 Lincoln College chapel has a series of stained glass windows of figures from the Old Testament. On the north side are prophets and on the south side there are the Apostles. The prophets represented include David, Daniel, Elijah, Isaiah, Jeremiah, Ezekiel, Amos, Zachariah, Malachi, Elisha, Jonah and Obadiah. They date from 1629-30 and are probably by Bernard van Linge. Some of the figures are identical to those found in Lincoln's Inn chapel in London.